Raptor expert Pete Bloom gave a well attended presentation at the November 10, 2010 Los Angeles Audubon meeting on Swainson ’s hawk in the Antelope Valley. 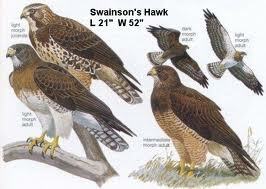 His presentation revealed that there are 10-14 breeding pair of hawks left in the Valley in Los Angeles and Kern County, that they are the southernmost breeding population in California, that they are fairly isolated from other populations of Swainson’s hawk, and that they are in danger of being extirpated by loss of habitat, especially conversion of agricultural lands from a rapid increase in solar development . Pete’s requested that Los Angeles Audubon and other Audubon chapters to do what we can to protect the birds. This sent your Conservation Chair to the City of Lancaster to meet with Planning officials to find out what solar projects were under application and where they are in relation to Swainson’s hawk nests. Surprisingly, the meeting revealed that the comment period for a solar project was currently open. Accordingly, Los Angeles Audubon submitted comments on this site especially regarding Swainson’s hawk, Mountain plover, LeConte’s thrasher and Burrowing owl. That letter is available for review by contacting me here. It was interesting to learn from City planners that the city of Lancaster has a bird watcher and bird artist as Vice Mayor and City Council member, and that the City levies a $700/acre development fee for every permitted project that goes into a mitigation fund for conservation. Recently the City purchased lands to add to the Poppy Reserve. Los Angeles Audubon suggested that this fund could be used to purchase permanent foraging habitat for Swainson’s hawk, and that Swainson’s hawk foraging habitat could also be good mitigation habitat for Burrowing owl, Mountain plover and other sensitive species at the same time. The problem of course is finding willing sellers of agricultural lands that could be good habitat, and raising enough money. California Department of Fish & Game recently released protocol for surveys for Swainson’s hawk in Antelope Valley of Los Angeles and Kern County that includes a guidelines that “suggest surveys and acquisition of mitigation lands prior to construction of the project if nests are found within five miles of a project site.” If those of us who are interested in Swainson’s hawk conservation comment on upcoming solar projects, then we might encourage developers to mitigate for impacts on foraging habitat for the hawks. We have good yearly Audubon Christmas Bird Count data, mostly supplied by Nick and Mary Freeman and volunteers that accompany them every winter, but outside that winter period there is little raw data to use for conservation of Antelope Valley birds. I urge you to enter your sightings from trips to Antelope Valley into eBird so that Los Angeles Audubon and other conservation organizations can use this data to protect our birds. Antelope Valley is an Audubon California Important Bird Area. The Important Bird Areas Program of BirdLife International aims to identify, monitor and protect a global network of IBAs for the conservation of the world's birds and other biodiversity. National Audubon, and Audubon California as the state office, are the American partners of BirdLife International.